This version of the Clément X'Plor MSO features a premium 120 TPI casing and dual compound tread. 65-90 recommended PSI. Folding bead. 700c x 32mm or 40mm (32/40-622 ISO). 485 grams. Bottom Line. Great Gravel tire but don't run them tubeless. I prepped for and raced the Oregon Coast Gravel Epic on these (MSO's 40mm 120TPI clinchers with latex tubes, 40psi). 4.5 hours, half pavement half gravel logging roads, lots of up and down. The tires were great. Saw more of these out there than any other tire, including in the lead group, for good reason. They're light, supple, and probably the fastest 40mm you'll find that is gravel suitable not a smooth road tire. Excellent grip for wet and dry, but not a mud tire for deep or peanut buttery mud. The treads are not tall, so fast and not squirmy cornering on asphalt. I run tubes (don't like the hassle of tubeless or tubulars) and am a big fan of having enough width that you can run soft enough not to get bounced around, and not pinch flat. So 40mm tires have that advantage over 32 or 35 if you can fit them. For logging roads the 40s are perfect. They roll fast on pavement, too, as the treads are supple and less tall than WTB nanos and some other gravel tires. I also spent quality time this year on the X'Plor USH 35mm 120 TPI's which you might also consider, too. My thinking was the USH's might roll a bit smoother on asphalt with their continuoussmooth center tread stripe. In terms of fast rolling speed they're too close to say. The MSOs don't have the more solid center stripe, so in theory they'd be a little slower, but the MSOs' center tread is more supple so it deforms more easily and in theory that might offset. The MSOs wear fairly fast-faster than I would expect from the USH's which have more rubber down the center. Can't have it all. 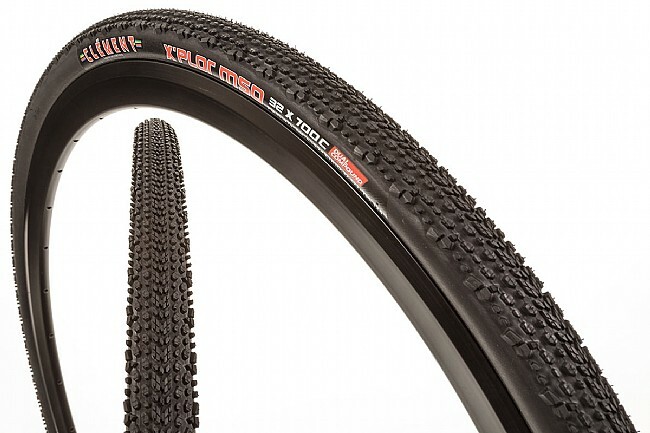 The sidewalls are sturdier than 'cross racing tires (say, my PDX's which I love and have much thinner more flexible sidewalls), but not as burly as some heavier options. I'm 155lbs and don't often get sidewall cuts, and these have been fine. Overall I recommend the MSOs and Clements generally very highly. Just pick the one that meets your needs. These 40mm tires are awesome. Much lighter & better rolling resistance than I expected. Flat prevention could be better tho. Everything I'd hoped they'd be. Mounted with tubes on 29er MTB to use as gravel/road trainer wheels. Front is on a Bontrager Elite, rear is a Bontrager Mustang. No problems so far and have held up well on loose, chunky gravel to sand to pavement. I used this as my front tire for Dirty Kanza 2014 and it performed flawlessly. I've previously used Kenda Happy Mediums and while you absolute can't go wrong with the Kendas, I found the X'Plor MSO to give me the same traction and ride quality on loose steep gravel roads in a much narrower size. For me, the X'Plor at 32 mm performed as well as the Happy Medium in 40 mm, which gives it a big advantage in speed over a long day. It seemed like the X'Plor had better vibration damping than the Happy Medium as well. The tire is very stable at all speeds and throughout the varied terrain of the DK, and in fact I'm sure the excellent traction and ride stability saved me from crashing at one point in the race. I hit a very steep downhill section and suddenly both lanes were insanely washboarded out and a guy was in front of me in the only smooth track in the center. I went over to the extreme edge to avoid hitting the other guy and the gravel there was very loose in a ridge bladed up by the grader at some point. I have no idea how the bike held without going over the edge or sliding sideways, but I actually felt in control almost the whole time. Almost. I would absolutely buy this tire again, and will continue to run them on the front for training and gravel racing. Given that I blew out the X'Plor USH 120 TPI on the back after about 300 miles, though, I suspect the X'Plor MSO might not be suitable for the back. I haven't used it there, so don't know that for sure. I just know that 90% of my flats as well as those I see during DK are on the back, so a heavy tire there is definitely warranted. These tires are great. I rode about 1100 gravel miles on the MSO's 32mm (120) without a single flat, so for such lightweight tires they've had more protection than I thought. They also have good traction around turns and feel light going uphill. They're starting to wear down, but I have no regrets getting them. I have one bike that has to do duty as a mountain bike, commuter, and road bike. I put the tires on a Jake The Snake cross bike and am pleased with its performance. It handles dirt, gravel and pavement well. Overall, it is a very quick ride. Not great in mud, but I have never had a tire tha was. Luckily, I seldom have much mud to deal with. The tire is predictable and smoother and faster on pavement than it should be. I recommend it. The tire worked great for both myself and my girlfriend at DK 2015. No flats. Ran the tire at 65psi. I bought these tires for my adventure bike... go anywhere, do anything, but most miles are road miles. The lower inflation pressure pressure creates an amazingly plush ride. I'm a superclyde so I run them at 65-70psi fr. The ride is so plush I have to keep looking down at my speed only to be surprised at just how fast I'm going. Good grip at speed in the corners. They're pretty quiet too. Beautifully made but spendy. I used to run these, as they were considered one of the best gravel tires if not the most chosen, all except on the pro bikes. Where if $ were no object, the Challenge Grifo XS series was chosen, as it is the BEES KNEES. The one issue with the Challenge Grifo XS is they did not come any wider than 33mm. Now Challenge has come out with an upgraded series casing called the Gravel Grinder and in OT 36mm or vulcanized 38mm, both of which now smoke this tire. This tire not only is out engineered now, it is also far more expensive than the same betterequivalent version by Challenge Tires with the Gravel Grinder. Better yet is the fact that the Challenge GG's ride smoother, as well as are seriously lighter and just as tough all for less$! I rode the 32mm tires in the DK200 this year. They are fast tires on the hard pack, held up well to the rocks, but were a little loose in the corners, but I attribute that to the narrow width. Bought the 40 mm which turned out to be too wide in the rear for my ibis hakkalugi. Then bought the 32 mm which were juuuust right. I was using a tubeless cross tire before so the 40 mm definitely seemed heavy with tubes. The weight is not so noticeable for the 32's. Anyway, these bad boys did great in a gravel grinder. No flats but these tires seem more flat proof than a cross tire. Apparently these are a go-to tire for the dirty kanza and such. Oh yeah, these little ******* are spendy too so I have to dis'em for dat. I used 32's on my Trek 520 for several longish rides in Virginia and in Montana (near Missoula, its' namesake). At first I found the microknobs to be a bit dicey on the pavement when turning, they wiggle but on the gravel they ran quite predictably. Any gravel ride always is a mix of conditions and no tire is ever right all the time. When on rocky gravel I wanted the 40's instead of the 32s, esp. when sharp rocks were flicking around and up the sidewalls - but on the road those ran quite comfortably. Overall happy. Unsure that the flat resistance is sufficient. I think next time I'll mix 40 to the back with the 32 up front. That might be the trick. I have found this to be an excellent tire for gravel type races and rides on my cross bike. I also use it to ride on paved roads from my house to nearby trails. Got these in 40's not a good option for gravel!! Knobs too close and no grip. 1 of 24 customers found this review helpful. Horrible for gravel road riding. Actually dangerous with crowned roads and winds. After a very positive experience with the USH 35mm. on my cycle cross bike that I use exclusively for gravel mountain roads, I was hopeful that the MSO 32mm. would be a good fit for my commuterwinter bike. What I was amazed by, was the low rolling resistance on pavement. They are every bit as fast as my summer tires at 70 psi.. How do they do that?? I am very confident with these tires on slush and snow as well as soft ground and gravel, but it's my ability to cruise when the pavement is dry that adds a smile to my numb face. With some pressure these tires are great on pavement. A little softer and they provide great traction on dirt and gravel. Well designed, go wherever you want tire! Great tire. 'luv the 120 tpi, it's worth every penny! The bike came with the 60 tpi version in the 40-622 size. 'had to replace the rear after a sidewall gash lead to a blowout and decided to spring for the 120 tpi casing and dual compound. I'm extremely pleased with the tire and would purchase it again. Rail corners on pavement and then jump onto a dirt trail (40mm tire at 60 psi) you'll have a blast!